Every summer, kids can go up to three months without math and reading. That break can actually result in the loss of math and reading skills and can add up over time. This loss is called Summer Learning Loss or Summer Slide. But academic programs, camps and access to reading material can combat summer slide. Garner Road includes time dedicated to reading and reading comprehension in our summer camp program. We also have books donated to the center all of time. Here are two resources we suggest so your kids can have access to free books at home during the summer. 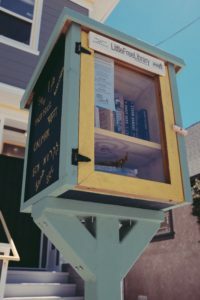 All over the nation, Little Free Libraries have been crafted and stocked by communities as a way to share free books with each other. Here in Raleigh, The News and Observer has a little free library they are all always filling with great books. Kids and adults can take the books home to keep, bring them back for someone else to enjoy, or donate books to share. Wake County Public Library has several locations where you can sign up for a library card. Kids under 13 have to have a parent or guardian with them to sign for a card. Library cards are free to all Wake county residents. The library also offers great reading programs for kids and teens.